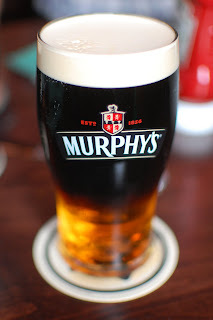 Murphy's, Guinness, and other stouts have a lower density than ales, or in this case, cider. The difference in density allows a stable layering of two beverages with a fairy precise boundary. This Black and Tan (or Half and Half) helped celebrate a father-to-be. The event was billed as a Man-Style Baby Shower, and delivered as promised.